Ally organizes an eco-fashion show as part of the DoItEco Project, to be held on January 14, 2014 in Technopolis, Athens. This exclusive evening will include not only a fashion show, but original artwork by Fabrizio Brixio Braghieri and an auction, the proceeds will be donated to the organization ''Μαζί για το παιδί'' ("Together for children") . The project includes collaborations with Aephoria.net and nonprofit platform Ecoluxe London. 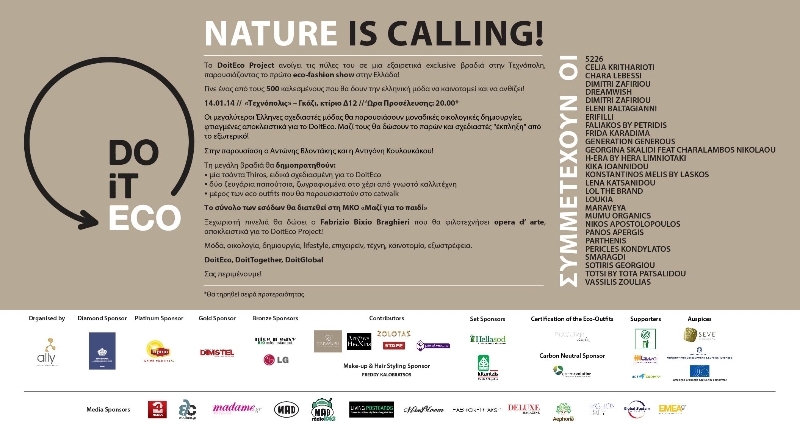 In building D12 Greek fashion designers will present 26 creations prepared exclusively for DoitEco, made ​​from eco-friendly materials and will contribute by sending a message of sustainability and genuine love for the environment. Participating designers are: 5226, Celia Kritharioti, Chara Lebessi, Dimitri Zafiriou, Dreamwish, Dimitri Zafiriou, Eleni Baltagianni, Erifilli, Faliakos by Petridis, Frida Karadima, GenerationGenerous, Georgina Skalidi feat.Charalambos Nikolaou, H-era by Hera Limniotaki, Kika Ioannidou, Konstantinos Melis by Laskos, Lena Katsanidou, Lol the brand, Loukia, Maraveya, Mumu Organics, Nikos Apostolopoulos, Panos Apergis, Parthenis, Pericles Kondylatos, Smaragdi, Sotiris Georgiou, Totsi by Tota Patsalidou and Vassilis Zoulias. During the event a Thiros bag, specially designed for DoitEco Athens and two pairs of shoes by TOMS , hand-painted by a famous artist will be auctioned.